WatchTV is the latest live TV streaming service to consider, but you might not have to pay for it. AT&T is bundling the service with two of its new plans. Along with an unlimited plan, you’re getting access to a premium video and music streaming services in addition to traditional TV channels at no extra cost. The new plans are called ‘Unlimited & More’ and ‘Unlimited & More Premium.’ Both get you WatchTV, which is the hub for dozens of TV channels. Most of them come from WarnerMedia, which AT&T owns. But there are also some from A&E, Discovery, and Viacom. 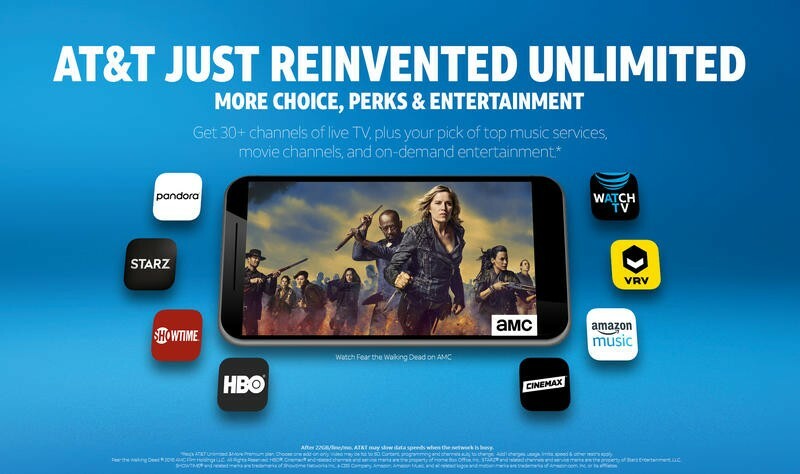 AT&T sweetens the pot by throwing in a video or music streaming service with the Premium plan. The choices on the video side include HBO, Cinemax, Showtime, and Starz. If you’re into music, you get to pick Pandora Premium or Amazon Music Unlimited. Those of you hungry for even more content will appreciate the $15/mo credit toward DirecTV Now. The channel lineup for WatchTV ranges from CNN to History to IFC to TNT. From the start, Watch TV has a diverse mix of channels that can be watched on any device. Unlimited & More is $70/mo, but you probably want to pay $80/mo for the beefier plan. It includes high-quality video as well as 15GB of high-speed tethering. The same credit from before also extends to DirecTV and AT&T U-verse. With the merger between AT&T and Time Warner complete, the bigger company is focusing on content creation and distribution that play off each other. AT&T has the subscribers, and Time Warner has the content. Now it’s a matter of connecting the two and WatchTV does exactly that. If you’re interested, WatchTV will be available next week. Both new and existing customers can sign up for the plans that have it bundled, and AT&T should offer it as a standalone service for $15/mo at the same time.